So, you’ve just bought the best house in the street. 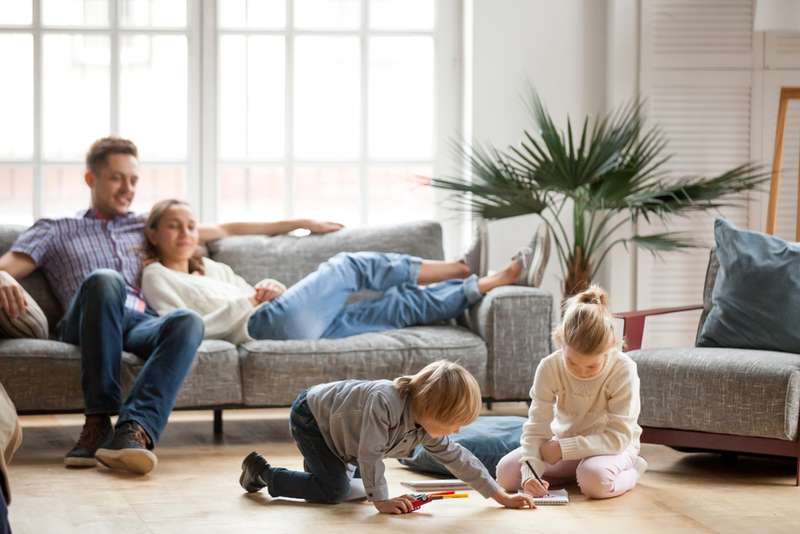 Now that you’ve finished moving home, it’s a great time to ask, “How can I make it child-friendly?” At your eye level, it’s a very different world from a little one’s perspective. So, we’ve taken a look through their eyes to point out the potential hazards and remedies to make your new abode a place of safety as well as newfound joy. Place rubber corners on all sharp-edged furniture to protect little heads from big bumps. Door stops and foam door jammers remove the chance of toddlers slamming a door on their fingers. Door gates are perfect for corralling babies and toddlers to one area or away from stairs/exits. All unused power sockets should have covers on them. Pot handles hanging out from the stove are dangerous to everyone, but kids think they can hang off them like monkey bars. So always turn the handles in over the bench. If you simply haven’t the storage space for all of your appliances, make sure all chords are coiled up away from the edge too. Anti-opening devices are essential to keeping oven doors and cupboards closed. They’re also brilliant for ensuring knives stay in the drawers until you need one. A moving home priority has to be to keep medicines and cleaning products up high. Medicines are best in a locked cabinet and cleaning products on a shelf. For water safety, use a rubber-backed mat to stand on when you’re drying kids off and a non-slip rubber mat in the base of the bath or shower to prevent slips when getting in and out. It’s also better to have your taps and the water spout out of your child’s reach. Never underestimate the danger of a blind’s dangling chord. It is an invitation to slip ahead through. This hanging hazard is easily removed by fixing the bottom of the chord to the window frame. It will still operate the blind and there’ll be no slack in the chord. Radiators are infamous for causing fires when clothing or bedding falls on the open coil. Instead, go for a panel or oil heater. Both are very efficient and are more economical to run. Lastly, get rid of all choking hazards. Basically, if anything’s the size of a golf ball, remove it. Kids love to climb so fix any freestanding bookshelves to walls. If anything sits under a window, try moving it so there’s no easy step up to an open window. In fact, it’s very wise to have a window lock fitted to any window and never leave the room unattended if an accessible window is left open. Moving home can be full of challenges but some wise child-friendly planning early on will give you some breathing space while still allowing your kids to enjoy their new surrounds. For many more handy property settlement ideas, along with the most thorough conveyancing process in Perth, contact Crescent Conveyancers today.